The pancreas is a gland in the abdomen. It’s about six inches long, shaped like a flat pear and surrounded by the stomach, small intestine, liver, spleen and gallbladder. The pancreas is both an exocrine gland and endocrine gland, and it has two main functions: digestion and blood sugar regulation. The pancreas’ exocrine cells produce enzymes that aid in digestion. When food enters the stomach, exocrine cells release the pancreatic enzymes into a system of small ducts that lead to the main pancreatic duct. The pancreatic duct carries pancreatic enzymes and other secretions, collectively called pancreatic juice. The main pancreatic duct connects with the common bile duct, which carries bile from the gallbladder. Together, they connect with the duodenum at a point called the ampulla of Vater. This is where bile and pancreatic enzymes enter the duodenum to help with the digestion of fats, carbohydrates and proteins. The pancreas’ endocrine cells produce hormones, which are substances that control or regulate specific functions in the body. The two main pancreatic hormones are insulin, which lowers blood sugar levels, and glucagon, which raises blood sugar levels. Endocrine cells called islet cells produce and secrete insulin and glucagon into the bloodstream. Together, these two main hormones work to maintain the proper level of sugar in the blood. Pancreatic cancer begins when abnormal cells within the pancreas grow out of control and form a tumor. These cells could be either exocrine or endocrine. More than 95 percent of pancreatic cancers are classified as exocrine tumors. These tumors start in the exocrine cells that make pancreatic enzymes that help in digestion. Within this category, the vast majority of tumors are adenocarcinomas. Pancreatic neuroendocrine tumors (pancreatic NETs or PNETs) account for less than 5 percent of all pancreatic tumors. They may be benign or malignant and tend to grow slower than exocrine tumors. The exact causes of pancreatic cancer are not yet well understood. However, research studies have identified certain risk factors that may increase the likelihood that an individual will develop pancreatic cancer. If a person’s mother, father, sibling or child had pancreatic cancer, then that person’s risk for developing the disease increases by 2 to 3 times. The risk increases if a greater number of family members are affected. The risk of pancreatic cancer also increases if there is a history of familial ovarian, breast or colon cancer, hereditary pancreatitis or familial melanoma. Approximately 10 percent of pancreatic cancer cases are related to a family history of the disease. Pancreatic cancer is more likely to occur in people who have long-standing diabetes (more than 5 years). People with chronic pancreatitis have an increased risk of developing pancreatic cancer. Chronic pancreatitis is common in individuals who consume large amounts of alcohol for many years. The risk of developing pancreatic cancer is even higher in individuals who have hereditary pancreatitis. Smoking: Smoking may cause about 20 to 30 percent of all exocrine pancreatic cancer cases. People who smoke cigarettes are two times more likely to develop pancreatic cancer than people who have never smoked. Obesity: Obese people have a 20 percent increased risk of developing pancreatic cancer when compared with people who are of normal weight. The risk is even higher in people who are obese during early adulthood. People with excessive abdominal fat may have an increased risk independent of general obesity. Race (Ethnicity): African Americans have a higher incidence of pancreatic cancer when compared with individuals of Asian, Hispanic or Caucasian descent. There is also a higher incidence of pancreatic cancer among Ashkenazi Jews. Age: The chances of developing pancreatic cancer increases with age. Most people diagnosed with pancreatic cancer are over the age of 60. Diet: Although the link between diet and the development of pancreatic cancer is still unclear, a diet high in red and processed meats is thought to increase the risk of developing pancreatic cancer. A diet high in fruits and vegetables may decrease the risk. Pancreatic cancer may cause only vague, unexplained symptoms. If you are experiencing one or more of the symptoms below, we urge you to speak to your doctor immediately and reference pancreatic cancer. Ascites is the abnormal accumulation of fluid in the abdomen. This extra fluid causes the belly to become swollen and distended. Learn more about ascites. Pain in the mid-back or upper abdomen could be caused by the tumor pushing against or invading nerves or organs located near the pancreas. Learn more about managing pain. Weight loss is a common problem in patients with pancreatic cancer and can be associated with treatment or the cancer itself. Cancer-induced weight loss (also known as cancer cachexia) is a complex issue that can cause the body to burn more calories than usual, break down muscle and decrease appetite. Unexplained weight loss may be an early symptom of pancreatic cancer and can occur without any pain or apparent change in digestion. Jaundice is a yellowing of the skin and eyes caused by excess bilirubin (a component of bile) in the blood. It is common for people with pancreatic cancer to experience jaundice. People with jaundice may also experience itchiness of the skin, abnormally dark urine and light or clay-colored stools. Diabetes is a condition in which the body does not make or properly use a pancreatic hormone called insulin. Insulin helps the body use glucose (sugar) efficiently. Research suggests that new-onset diabetes in people over the age of 50 may be an early symptom of pancreatic cancer. A sudden change in blood sugar levels in diabetics who previously had well-controlled diabetes may also be a sign of pancreatic cancer. Common digestive difficulties associated with pancreatic cancer include poor appetite, nausea and indigestion. Some or all of these symptoms may occur when a tumor in the pancreas presses against the stomach or first portion of the small intestine, known as the duodenum. If this happens, food may remain in the stomach and cause several digestive difficulties, including nausea and vomiting. Various changes in diet, pancreatic enzyme products and other treatments can help to alleviate many digestive symptoms. Staging is the process doctors use to determine the extent of the cancer in the body. After a pancreatic cancer diagnosis has been made, additional imaging tests and surgery may be required to accurately determine the stage. Learn more about the staging of pancreatic cancer. The CA 19-9 Radioimmunoassay (RIA) is a blood test that measures the level of tumor-associated antigens in the blood. Learn more the CA19-9 test. During an EUS, an endoscope (a thin, lighted tube) with a small ultrasound probe built into the tip is passed through the patient’s mouth into the stomach and the duodenum. The ultrasound probe is used to obtain immediate, detailed images of the pancreas, digestive tract and bile duct. Learn more about the endoscopic ultrasound. You are your own best advocate. We strongly recommend that you discuss your treatment goals with your healthcare team and know all your options at every stage of your disease. We maintain the most comprehensive database of available pancreatic cancer clinical trials in the United States. Our Patient Central Associates are available to perform a personalized search for you, or you can start your own search through our Clinical Trial Finder. The main types of pancreatic cancer surgery are the Whipple procedure (pancreaticoduodenectomy), distal pancreatectomy and total pancreatectomy. 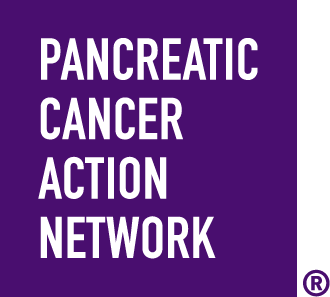 The Pancreatic Cancer Action Network strongly recommends that individuals with the disease see a surgeon who performs a high volume of pancreatic surgeries (more than 15 per year) to determine eligibility. Learn more about pancreatic cancer surgery. Available therapy types for pancreatic cancer may include chemotherapy, targeted therapy, radiation therapy or others. Patients may also consider complementary and alternative medicine, which refers to therapies extending outside of normal practices of conventional medicine. No one should have to face pancreatic cancer alone. We’re here for you. If you or someone you know has been diagnosed with pancreatic cancer, please call a Patient Central Associate toll-free at 877-272-6226 (Monday to Friday, 7 a.m. to 5 p.m. PT) or email patientcentral@pancan.org to speak with a knowledgeable, compassionate associate. Visit our Patient and Caregiver Services for more pancreatic cancer resources.